On Day 2 of EmTech Asia, the winners of the recently held MIT Hacking Medicine Robotics Singapore 2017 came together in a panel discussion, moderated by Howard Califano, Director, SMART (Singapore-MIT Alliance for Research & Technology) Innovation Centre. This was the first hackathon in Asia focused on social use of robotics for eldercare. The event was organised by SGInnovate over the past weekend, from February 10 – 12, 2017. It called upon developers, clinicians, engineers, designers, researchers and business managers to build software and hardware applications on the Segway Robot platform. The Segway Robot is an open platform project. The hackathon saw 83 participants in 12 teams working to address a range of eldercare challenges from fall prevention to detecting dementia and monitoring cardiac health. The hackathon opened with a Facebook ‘LIVE’ panel with Minister for Foreign Affairs and Minister-In-Charge of the Smart Nation Initiative, Dr Vivian Balakrishnan, who joined healthcare and robotics experts to discuss challenges and opportunities in eldercare in response to ageing populations around the world. Team Botler won the top prize with their work on autonomous mobility for healthcare. The team developed an autonomous system for transporting elderly patients and residents at nursing homes and extended-care facilities to where they need to go. Mr. Kok Yuan Yik, representing Team Botler talked about a hypothetical use case in a nursing home with 50 elderly wheelchair bound patients and only 4 caregivers. The system utilises facial recognition algorithms to identify patients, then connects with their wheelchair using a custom-designed electromagnetic coupling, allowing the robot, Loomo to move wheelchair-bound patients to and from activities such as meals and medical appointments. This also frees up manpower, enabling caregivers to focus on more critical care and medical tasks and provide higher quality care. Team DORI, which came in second, tried to address the social costs of late detection of dementia. The longer it takes to detect dementia and the longer it is left untreated, the higher the costs. Their solution was to create an interface on top of Loomo for interacting with senior citizens in elder care facilities and assess the cognitive health of the seniors. The assessment would be based on the conversations, the questions they are asking. The data would be stored in a cloud-based system and be available to the individual’s doctors and family. The eventual hope is to be able to assess cognitive decline over time. Third-place winners, Team NOW, designed a robotic nurse-on-wheels (NOW) able to detect, diagnose, alert and manage cardiac events amongst elderly patients. Hypertension affects 1 in 4 Singaporeans above the age of 40. So, Loomo could be a nurse on wheels, attending to the elderly living alone at home. It can recognise and interact with the elderly, monitor their blood pressure. In the event, it detects a problem, it can interface with a healthcare professional, who can make a virtual diagnosis using the visual sensors on the robot. The robot could then tweak the medication or alert an emergency response team, depending on the situation. To take forward the implementation of the concepts developed, these top three teams will have access to prototyping facility labs, the Segway Robot Developer Edition platform, Loomo, as well as funding to build on their solutions and launch their companies, in addition to cash prizes. During the panel discussion, Shirlene Liew, Adjunct Consultant, ACCESS Health highlighted that participants in the MIT Hacking Medicine Hackathons need not be coders or engineers. Over 50% are from other backgrounds, such as designers, business people and last but not the least, healthcare professionals, who understand the social problem and where people can be of most impact. The same applies for the mentors, who do not have necessarily have a technical background. Secondly, there is a strong emphasis on understanding the problems the teams are trying to solve and users’ needs. It is more about asking the right questions. 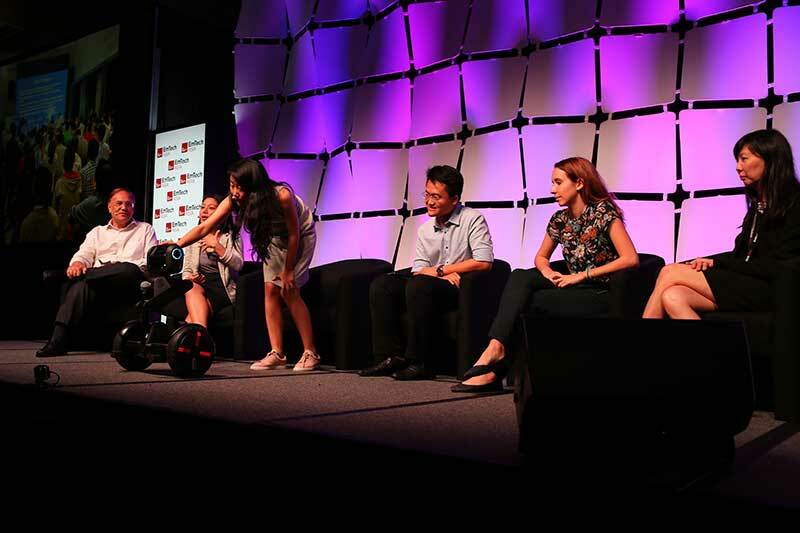 Sarah Zhang, Business Lead and Head of Developer Partnerships, Segway Robotics, provided a brief introduction to the robot, Loomo, describing it as a smart machine that transforms between being a self-balancing transporter and an autonomous robot. Developers can build apps and add accessories for customisation. She said that the outbreak of robotics is being driven by the integration of next generation multi-sensory interactions (vision, speech) and increasingly powerful capabilities to acquire, process and utilise data. ‘Natural’ interactions are highly important for robotics applications in eldercare, as their experience with digital interfaces and devices might be limited. The judging panel consisted of Steve Leonard, Founding CEO, SGInnovate, Ong Jeong Shing, Investment Director, VentureCraft, Sarah Zhang, Business Lead and Head of Developer Partnerships, Segway Robotics, Gerard Chew, Head, IHIS Innovation Labs, Yorelle Kailka, Founder and CEO, Active Global Specialised Caregivers, Prof. Li Haizhou, Department of Electrical and Computer Engineering, NUS. Other partners for this event includes the Singapore MIT Alliance for Research and Technology (SMART), Singapore University of Technology and Design (SUTD), Venturecraft, EmTech Asia, Google, PIXEL Labs, Integrated Health Information Systems (IHIS), Action Community for Entrepreneurship (ACE) and ACCESS Health International. Read the press release from MIT Hacking Medicine and SGInnovate here.